Inspired by real events pertaining to the terrifying ordeal of Malayali nurses who were captured by the ISIS and brought safely back to India by a rescue operation of the Indian government, this movie Take Off is Mahesh Narayanan's directorial debut - the movie is intelligently crafted and showcases the spirit of sacrifice and dedication of Malayali nurses despite the tough conditions of life they are forced to live with. Right from the beginning, the narrative throws you into the difficult life and struggles of a Muslim working mother called Sameera, whose life catapults between her work and her longing for her son Ibru ( the little boy is adorable with his big, melting eyes and the sweetest, most lovable smile) and in between, you see her pop sleeping tablets to sleep - such is the stress in her life. You also get to see snippets of her strong personality flare up when conservatism and bias become too much for her to ''adjust'' with. For instance, when Sameera (starring Parvathy) picks up a plate casually while men are sitting down to eat, there is a look that passes between the disapproving men. The typical Malayali conservatism that men will eat first and women can eat later is still followed as social etiquette, particularly so among the elite Malayalis who are known to behave like ''upper-class elites" but in reality, embrace feudal mindsets that not only pin down a woman's identity but mocks her decision to work as being ''dishonourable" enough to create an ''earthquake" within the family. The typical Malayali elite family's ''prestige" depends on convincing the society that "the women in our family don't need to earn" - again a mask to cover up regressive, patriarchal mindsets. In Sameera's struggles, this is portrayed realistically and her husband's (starring: Asif Ali) lack of support in her decision to work becomes the final straw in their already strained relationship. Sameera's struggles stem from the strong decisions she takes - she defies her husband to pursue a job that will support her parents. Parvathy is brilliant as ''Sameera" - she becomes the protagonist and you will forget the actress playing the role. Her expressions are masterfully created to reflect the grief and hardships of the intelligent working woman called Sameera. Her dialogue delivery too has all the characteristics of the protagonist and her tough tone is consistent throughout the film. 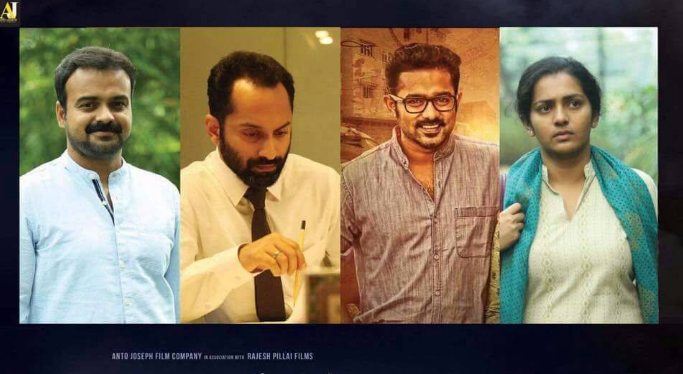 That Parvathy plays the role so effortlessly and towards the end, she steals the thunder from all the actors in the movie - be it Kunchacko Boban and Fahaadh Faasil. In the theater where I watched the film, Malayalis gave a heartwarming applause at the end where the subtitles mentioned how the External Affairs Minister Sushma Swaraj and Kerala Chief Minister Oommen Chandy worked together to bring back the kidnapped nurses safely back to India. The applause is well-deserved. Sameera's relationship with Shaheed (starring: Kunchacko Boban) is one with several shades of gray to it. From the start, you know that he loves her to a point of madness but throughout the movie, you wonder about her feelings for him - she is bold and intelligent but she holds back her emotions with people she loves. Her hesitation to talk about Shaheed to her son Ibru, her attempts to hide their relationship and her doubt about keeping her second baby trigger our doubts. Towards the end of the film, these doubts are clarified. To many, it may seem that Shaheed's role is weak but it is perhaps a very strong character that displays the character's strength solely through dialogues and subtle action. The subtle manner in which Shaheed always says, "Ibru is our child" and you can know that he means it though Sameera looks doubtful about it. There is a touching scene where Shaheed asks Sameera, "Who will you say I am to Ibru?" She has no reply. Sadly, the same strong Sameera is forced to bite down her anger and hurt when Shaheed's mother criticizes her father's decision to let his daughter go to Iraq. Shaheed's mother is concerned only about her son's welfare and her condescending conduct towards Sameera's parents reflect it. The movie also throws up serious concerns about how children are affected when parents divorce and marry a second time. The agony of a young boy who sees another man touch his mother cannot be conveyed in words. The grief of a young mother to hide the man she loves from her son's gaze can also not be fully expressed. Such is life - the choices we make often scar and hurt our children the most though we try our best to protect them. Once in Iraq, everything happens at once and we find the heart-wrenching struggles of nurses hard to grasp. As Manoj Kumar, Fahadh Faasil portrays the role of the Indian Ambassador in Iraq to perfection. His acting is subtle, nuanced and powerfully conveyed through his eyes, demeanor and voice. While we saw Akshay Kumar display the heroism of an action hero who is in rescue mode in the movie Air Lift, Fahadh Faasil outdoes this with a nuanced approach that only he can pull off so smoothly. Prakash Belawadi dons the role of the foreign secretary and he does not disappoint. It was also refreshing to have the Minister of External Affairs Sushma Swaraj and Kerala CM Oommen Chandy as unnamed speakers on the phone. Kunchacko Boban is impressive in his subtle portrayal as the man who loves Sameera beyond the boundaries of societal norms - he crosses the 'lakshman rekha' of conventional thinking for her. He is subtle and strong in his portrayal of ''Shaheed." Yet before we can admire Shaheed's heroism, he shows us that no man, however much he loves a woman, can want her to be truly free in spirit. The scene where he asserts his authority before a doctor and says clearly that his consent will not be obtained reflects the grim reality that Indian women face when it comes to making decisions about their own bodies - the husband decides, the woman, no matter how free or intelligent as Sameera is shown to be, has no choice but to bow her head and obey. The movie Take Off is a must-watch. Parvathy is stunning and brilliant as Sameera - she lives and breathes through the entire sequence of events as the protagonist. Mahesh Narayan's directorial debut deserves a big applause for bringing to life the struggles and hardships faced by Malayali nurses. Go watch this in the nearest theaters!